In Ohio on March 2, two fetuses "testified" before the Ohio House on behalf of the so-called "heartbeat bill." The hearing room was packed with spectators who listened to the rapid, gentle pulsing of the heartbeat from a 15-week old fetus, and the barely audible heartbeat of a nine-week old fetus. Ohio's "heartbeat bill" would ban abortions in the state as soon as a heartbeat could be detected, with exceptions for medical emergencies. But while a heartbeat may make for compelling "testimony," even most anti-abortion rights activists acknowledge the "heartbeat bill" wouldn't hold up in court. So why push this bill? Some anti-abortion activists may answer, why not? The anti-abortion rights movement last year found itself in a set of circumstances that have all worked to advance their agenda. Most importantly, states across the country elected new, emboldened conservative politicians. Hundreds of anti-abortion rights legislators and a net of 12 new anti-abortion rights governors were elected, according to Americans United for Life. Meanwhile, a set of news-making events in the past year -- such as the passage of health care reform and video of the conservative "sting" on Planned Parenthood -- galvanized conservative activists. National leaders are more vocal than ever on the issue. And a possibly sympathetic swing vote now sits in the Supreme Court. "It's been kind of a perfect storm of sorts," said Dan McConchie, vice president of government affairs at Americans United for Life. If legislation like the "heartbeat bill" is shot down in court, it only leaves anti-abortion legislators and activists with a status quo they can continue to fight. And while more extreme legislation wins headlines, lawmakers in Ohio and several other states are testing the bounds of the current legal framework for abortion -- or trying to change it -- with dozens of other less sensational bills. "Since some recent Supreme Court cases, particularly Gonzales, I think [anti-abortion rights activists] have felt emboldened to push the envelope," Planned Parenthood's Rachel Sussman said, referring to Gonzales v. Carhart, the 2003 Supreme Court case that upheld the federal partial birth abortion ban. "When you combine that with overwhelming wins at the state legislature, this is their moment," said Sussman, who tracks state-level anti-abortion efforts. For pro-abortion rights groups like Planned Parenthood -- which oversees a network of health clinics as well as a political advocacy arm -- the question is whether anti-abortion activists will botch the moment. "It's an overreach, and ultimately the public is going to reject it," Sussman said of aggressive efforts to roll back abortion rights and services. Debates about abortion rights often take place on the national political stage, but the bulk of the work happens in Columbus, Des Moines, Topeka and other state capitals across the country. "Ninety-five percent of what happens in any sort of laws or regulations on abortion happens at the state level," McConchie said. In Florida last week, a bill advanced that would bar private health insurers from covering abortion in plans paid for in whole or in part with any government funds. It's just one of at least 18 abortion bills pending in the Florida legislature, according to Americans United for Life. The bill is a direct response to the federal health care reforms last year. Anti-abortion groups harnessed the outrage conservatives voiced at the notion that expanded government health care could result in government-subsidized abortions, and they are helping more than 30 states craft legislative responses like Florida's. Five states already passed similar bills last year. In South Dakota, voters are waiting to see whether Republican Gov. Dennis Daugaard will sign a bill passed by the state legislature that would require any woman seeking an abortion in the state to receive a consultation at a "pregnancy help center" within the 72 hours before the procedure. The governor has until March 24 to decide what to do. Earlier this month, both houses of the Texas legislature cleared versions of a bill requiring a woman to get a sonogram before having an abortion. The state House and Senate still have to reconcile their two versions of the bill, but Republican Gov. Rick Perry made the legislation a top priority and said he will sign it as soon as it goes to his desk. Several of the state bills currently pending can be judged in the context of the 1992 Supreme Court decision Planned Parenthood v. Casey, which established that a state has an interest in the life of a fetus. Under that premise, the state can, for the most part, ban abortion at the point a fetus becomes "viable" (meaning it could survive outside of the womb). Many states now prohibit abortion, with certain exceptions, at the point of "viability," and several specifically ban abortion at either 24 weeks or the third trimester, according to the Guttmacher Institute, a reproductive health research center. The notion of "viability," of course, is something of a moving target and one that anti-abortion rights activists are seeking to push back. That could be accomplished with legislation such as the bill advancing in Missouri that would ban abortions on a fetus at least 20 weeks old and determined "viable" by two physicians. Other states have put forward similar legislation. Some bills, like the Ohio "heartbeat bill," would appear to be a blatant violation of the rule -- a heartbeat can be detectable as early as six or seven weeks into a pregnancy, well before a fetus is viable. But that doesn't necessarily mean legislation like this couldn't survive as law. In April 2010, Nebraska passed a law barring abortions after 20 weeks on the premise that the fetus could feel pain at that point. Opponents of the law dispute the science that allegedly proves that point -- but whether the science is valid or not, the law clearly disregards the viability test (by focusing instead on pain). The law went into effect in October but has yet to face any legal challenge. 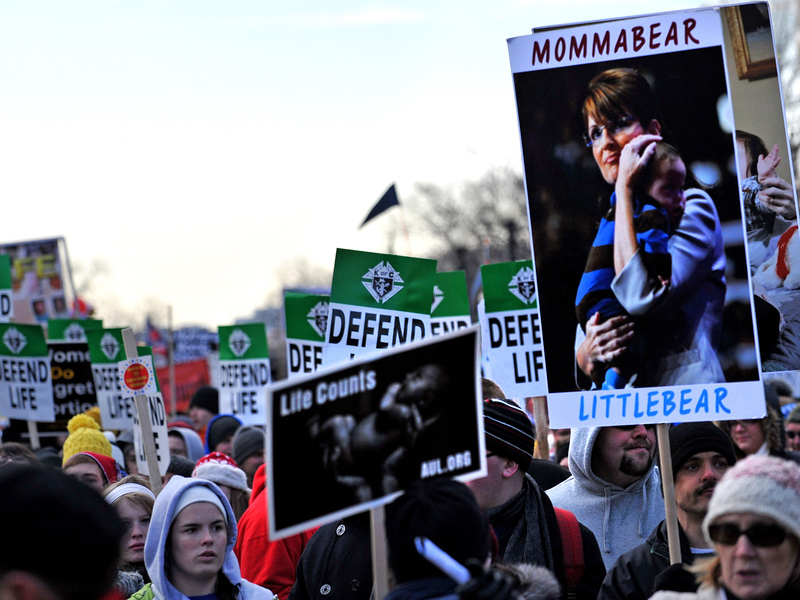 "Frankly, I don't think they want to have a public debate about the fact the child can feel pain," McConchie of Americans United for Life said, speculating as to why pro-abortion rights advocates have not challenged the law. "That is a PR battle they don't want to have... We can't force the other side to take the bait if we put it out there." With no challenge forthcoming, there are at least a dozen states where similar legislation was introduced this year, including Georgia, Florida and Oklahoma. If the case were to make it all the way to the Supreme Court, it's unclear what Justice Anthony Kennedy -- the swing vote on such matters -- would do. Kennedy voted with the majority in Planned Parenthood v. Casey, helping to establish the "viability" principle. However, given the "emotional" rhetoric he has used on the subject of partial birth abortion, it's conceivable Kennedy could overrule himself, said CUNY School of Law Prof. Caitlin Borgmann. "His faithfulness to the law and precedent is warring with his personal side," said Borgmann, who served for six years as state strategies coordinator for the ACLU's Reproductive Freedom Project. "It's unclear to me which one of those would win out in any given case." Mary Spaulding Balch, director of the department of state legislation for the National Right to Life Committee, contends the Nebraska law could set an entirely new legal precedent by saying the state can judge whether it has an interest in a fetus in terms beyond "viability." She cited Stenberg v. Carhart, the 2000 partial birth case in which Kennedy wrote, "...it was inappropriate for the Judicial Branch to provide an exhaustive list of state interests implicated by abortion." The Nebraska legislature was simply agreeing with Kennedy, according to Balch. "In this instance, there is a compelling interest in the pain-capable child," she said. Supporters of abortion rights are not only skeptical about whether the Supreme Court would buy that argument, but also about whether the public would. Planned Parenthood has been countering these legislative efforts like the Nebraska law by sharing the personal stories of women impacted by restrictive abortion measures. "At a substantive level, these bills go so far in attacking women's health care, that it is certainly an overreach," Sussman said, calling the efforts to roll back abortion rights in so many states and at the federal level an "onslaught." "If you went to the ballot box in November, and you voted on serious economic concerns and all you hear out of your state legislature is how we need to ban abortion, that is the crux of overreach, and the public is going to reject it," she added. However, McConchie contends that, so long as fiscal issues are not completely ignored, the voters who swept in the new Republican majorities will be satisfied. "People are going to look and say, 'That issue was good for me, and they also took care of the fiscal issues at the same time,'" he said.